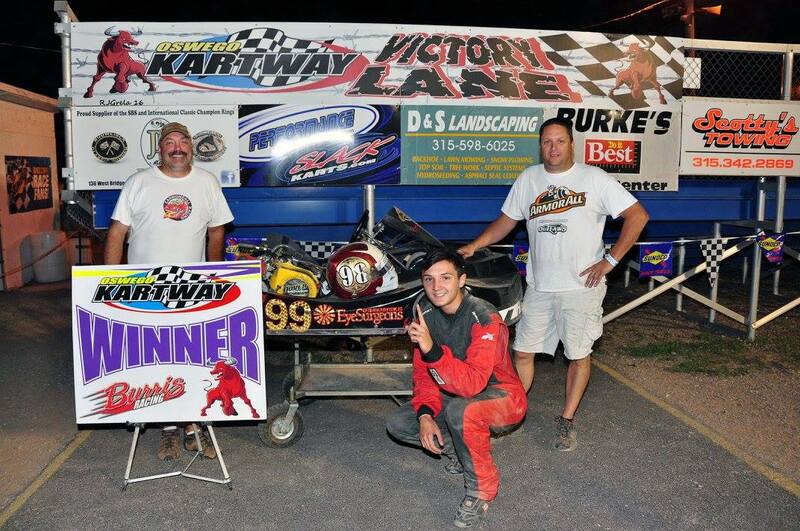 OSWEGO, NY – Oswego Kartway’s final event prior to the upcoming New York Dirt Kart Series special this Saturday saw 119 entries take on the Bullring, with tight racing across the board. 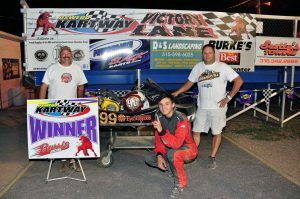 John Trenca earned another victory at Oswego Kartway on Friday in the Clone Light division. For the second week in a row in Clone Light it was John Trenca taking the win in the No. 99. Trenca bested a stout field which included Nick Demling, Seth Perrin, Nick Sitterly, and Dave Demling in the top five positions. One of the drivers looking to gain some extra track time last week ahead of the NYDKS event this weekend was former Kartway regular Chris Natoli. Natoli captured victory in the State Clone Light division over Ricky Pritchard and Jake Sivers while earning runner-up positions in State Clone Heavy and Stock Medium. Jamie Shutts earned the win in State Heavy driving No. 2, while Zach Mooney topped the Stock Medium field yet again in the No. 111. Other senior division winners on Friday included Matt Fay (Clone Super Heavy), DJ Shuman (Clone Heavy), Paul Fountaine (Masters), and Thomas Montgomery (Clone Medium). On the junior side Logan Crisafulli continued his winning ways in Jr. Purple Clone. Driving the No. 88, Crisafulli topped Hunter Hollenbeck, Kyle Devendorf, Madison Myers, and TJ Clayton for his fifth win of the season at Oswego. In Jr. Green Clone Jason Parkhurst would return to the top of the running order as he continues his tight battle for the championship with Emma Spaulding. Parkhurst led Cole Combes, Parker Allen, and Spaulding across the line in the main event. Other junior winners Friday included Tucker Fenske (Jr. Novice), Jacob Hutton (Sr. Green Clone), Griffin Miller (Jr. Blue Clone), and Jake Holmes (Sr. Blue Clone). The Kartway returns to action this Saturday as the NYDKS state karting tour comes to town for the first time. Pit gates will open at 11 a.m. with hot laps taking place at 2 p.m. and time trials at 3 p.m.
For more information visit online at www.nydks.com. As always spectators are welcome to come to the Kartway and enjoy the racing action. A full-service concession stand is open, with limited bleacher seating. Fans are encouraged to bring their vehicle and park along the racing surface for a great view of the action. Admission for fans is only $5 per car load. Kartway events run May through September on most Friday nights, culminating with the Fall Frenzy 200 Championships on Saturday, September 24.